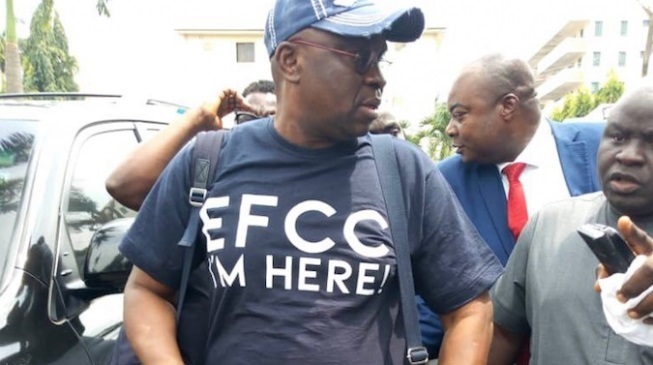 Former governor of Ekiti state, Ayodele Fayose spent his first day out of office on Tuesday in the detention cell of the Economic and Financial Crimes Commission in Abuja. After the dramatic scenes he created yesterday on his arrival at the agency’s office, he was taken into custody. He will be grilled on his receipt from the Office of the former National Security Adviser (ONSA) the sum of N1.3billion and $5.377million. The EFCC maintains that the money totalling N4.6 billion was part of the funds stolen from defence vote. The Nation reported that Fayose denied all the allegations against him and asked the agency to take him to court. “He made a statement where he denied all the allegations and asked the commission to take him to court. “So far, he has not responded to how he came about N1.3billion and $5.377million from ONSA. He has more issues to clarify; we are going to detain him,” an EFCC source told The Nation.